From September 20-26, 2018 your company will take part in one of the three congresses ESCRS / EUCORNEA / EURETINA, which will be held at the Messe Wien in Vienna. Whether you will participate as an exhibitor or as handling agent for an exhibiting company, we kindly ask you for your cooperation when it comes to organizing delegate transport services to/from the congress venue. Messe Wien is centrally located, close to the city center and only a few minutes by taxi or public transportation from the main congress hotels. As a green venue, Messe Wien of course encourages congress organizers to promote Vienna´s clean, safe and efficient public transportation system. The underground line U2 stops at both entrances of the venue. All coach transfers have to be reported to the congress organizer. Please contact Sam Warbrick at SAM.WARBRICK@escrs.org with the date, time and number of busses your transfer is planned for. In the subject line of your email please state “Vienna Bus Access Request”. Advise the coach company for which congress the transfer is ordered, as EURETINA delegates and ESCRS/EUCORNEA delegates will use different entrances. 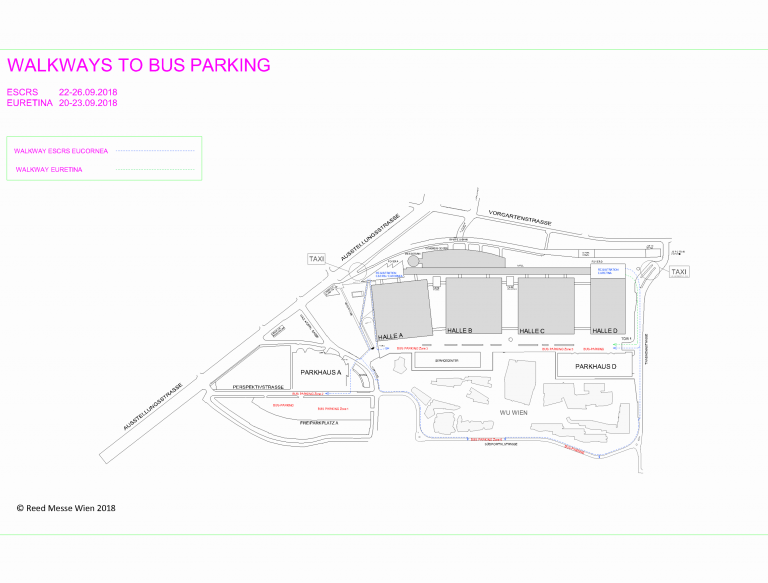 As coach parking around the venue is limited and more than one parking zone will be used for evening pick-up, please make sure to provide an accompanying guide with each transfer. This person has to meet delegates at their respective congress entrances to guide them to the right coach. Last but not least, please bear in mind that depending on which zone the coach will be waiting, the walk may take from 6 to 15 minutes. For ESCRS/EUCORNEA delegate Drop-Offs in the morning will be done in Zone 1 (see Zone Plan below). For ESCRS/EUCORNEA Pick-Ups in the afternoon/evening, all Zones will be in use and will be filled according to availability (see Zone Plan below). For EURETINA delegate Drop-Offs in the morning will be done in front of the EURETINA entrance (Entrance D). For EURETINA delegate Pick-Ups in the afternoon/evening, Zone 5 (behind Hall D) will be used (see Zone Plan below). Separate plans concerning access routes for transportation companies are available and have been distributed amongst the biggest Austrian coach companies. If your provider has not received such information, please request the plans with Katrin Windl at katrin.windl@messecongress.at.